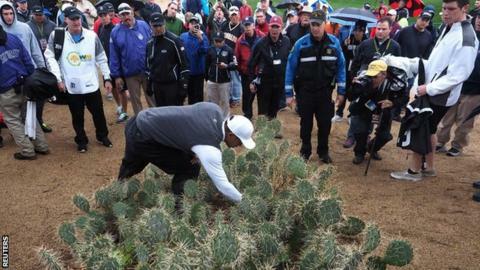 Tiger Woods recorded the worst round of his professional career with an 11-over-par 82 in the second round of the Waste Management Phoenix Open. While Scotland's Martin Laird led on 10 under, former world number one and 14-time major champion Woods was last in a field of 132 and missed the cut. The 39-year-old was playing in his first PGA Tour event of the season. "I've got to keep this in perspective. Sometimes that's hard to do," said Woods, who finished on 13 over. Struggling with his chipping, he carded six bogeys, two double bogeys, a triple bogey and two birdies in his second round at TPC Scottsdale. Woods duffed one chip from greenside rough and flew another straight over the flag and into a bunker. He also struggled from the fairway, leaving a chip from 20 yards off the green short. Out: 10th (par 4) 4; 11th (par 4) 5; 12th (par 3) 3; 13th (par 5) 5; 14th (par 4) 6; 15th (par 5) 8; 16th (par 3) 3; 17th (par 4) 5; 18th (par 4) 5.In: 1st (par 4) 4; 2nd (par 4) 4; 3rd (par 5) 5; 4th (par 3) 5; 5th (par 4) 3; 6th (par 4) 5; 7th (par 3) 4; 8th (par 4) 3; 9th (par 4) 5. His previous worst round was an 81 in the 2002 Open at Muirfield, a round completed in a storm that made scoring difficult. Woods, who carded a two-over-par 73 in his opening round, missed much of last season, including the Ryder Cup, after having back surgery in March 2014. "We all have days like this," he said. "Unfortunately mine was in a public forum and a public setting, but we all have days like this and we take the good with the bad." Laird, 32, who shot a second straight 66 in wet and windy conditions, said: "It was a very Scottish day today with the misty drizzle. The big thing was I drove well." American Daniel Berger is two shots behind Laird on eight under, while another tour rookie, Justin Thomas, is third on seven under. Phil Mickelson, a three-time winner in Phoenix, missed the cut after carding a second-round five-over 76.